To create an asphalt material capable of withstanding the high stress turning forces of high axle loading vehicles. The project scope was for three taxiways in a major international airport, Birmingham. Birmingham is the second busiest airport in the UK outside London, with 115,000 aircraft movements per year serving over 9 million passengers a year (Civil Aviation Authority 2007 figures). Bardon Airflex was promoted to BHX by Aggregate Industries as the correct material to cope with the considerable turning pressures in these pushback areas. The success of Bardon Airflex in dealing with this challenge led to BHX requesting that the material be laid over a much larger area. Bardon Airflex was laid to a depth of 40mm on the Whiskey, Victor and Echo taxiways. The aggregate used had a nominal size of 10mm and was sourced from Aggregate Industries Bardon Hill quarry. Construction on Victor and Echo involved a full depth reconstruction of the pavement structure that utilised a 60mm layer of Bardon Airmat as a binder course, a 70-170mm layer of 20mm HDM as a base and a geo-textile. One of the most pleasing aspects of the contract was the clear demonstration of Aggregate Industries ability to take an immediate solution to a client to solve an outstanding problem says Phil Evans, Area Manager for Bardon Contracting. The new surfacing application of Bardon Airflex at BHX was the first of its kind in an airfield application in the UK. Bardon Airflex is a premium heavy duty asphalt range for airfield applications that has been designed to withstand high axle loading and stresses. The product was initially installed at BHX in areas of the Whiskey Taxiway where aircraft are pushed at 90o from parking stands by powerful, low profile vehicles called tugs. This process (called pushback in the aviation industry) exerts considerable turning pressures. Bardon Airflex through this application and testing has demonstrated a high level of performance and durability that outperforms traditional asphalt options says Bob Allen, Head of Infrastructure for Aggregate Industries. The product can utilise a binder designed to remain stable over a wide temperature range, enabling it to cope with hot surface temperatures. 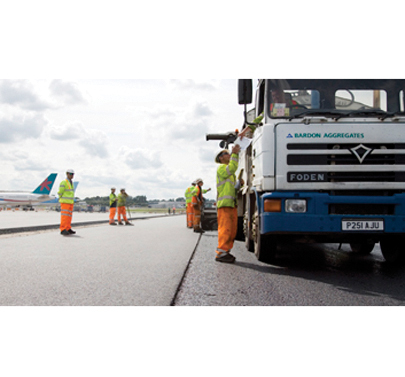 Bardon Airflex was subsequently used for the successful resurfacing of BHXs larger Victor Taxiway and on a stretch of the Echo Taxiway. Bardon Airflex was manufactured at Bardon Hill Benninghoven asphalt plant using a polymer modified binder (PMB) designed to have a high softening point.